When a village is nestled at the foothills of a famous mountain, many of its events will be related to the looming giant. Our mountain is Mt. Ventoux, the “Giant of Provence.” The biggest event involving an ascent will be this summer’s Tour de France. Lately, in a sort of “we too can take on the mountain” there have been several preliminary ascents. Well, I say several even though I a m not actually sure of the first. It involved antique cars. One day last week while heading for the grocery store, my wife and I noticed a series of classic cars, old racing cars it seemed, driving through town. Some, like the one pictured, had been parked while the owner took a coffee break. What were they doing here? My guess: they were involved in some sort of rally that involved taking the twisting road up Mt. Ventoux. That’s only speculation, though. If they were headed up the mountain, at this time of the year, they could not make it all the way to the top. Those roads are still closed because of snow. If they were headed for Ventoux they were continuing a venerable tradition. 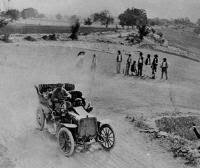 The first motorcar race up Ventoux took place in 1902. Winning the race required a speed of 47.5 kilometers per hour. The tradition has continued recently with a race in early June through 2007. There is little information available about 2008 or this year. Besides vehicles with wheels, people under their own power have sought to reach the summit. Francesco Petrarch in 1336 was the first famous figure known to have reached the summit. The Provençal poet, Frédéric Mistral, whose name matches (coincidentally) the “mistral,” provence’s famous wind, engaged in a pre-dawn 1859 climb so he could experience sunrise from the summit. Besides the many hikers drawn to the mountain, there is also a yearly foot race that takes participants from pavement, to trail, to rocky terrain, to snow before descending again. It’s called “The Trail of Ventoux,” or in French Le Trail du Ventoux. Why the French use the word “trail” when they have at their disposal the perfectly good piste is a mystery. What is not a mystery is the popularity of the event. The most recent one took place on Sunday March 22. One thousand runners massed in the square just in front of the village school for an 8:30 a.m. departure. There were two itineraries, one of 24 kilometers which avoided the summit, and the other of 42 kilometers which reached it. The fastest Boston Marathon was run in 2 hours and 7 minutes. It would take a speed faster than 2 hours 3 minutes and 59 seconds to beat the world record. 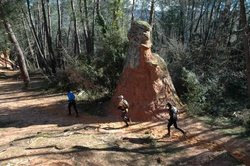 Such times make little sense when the race is marathon length but over the kind of varied terrain covered by the Trail du Ventoux. Unlike the more famous marathons where water is offered to runners at regular intervals, competitors in the full-length side of the Trail are required to carry water with them. On Sunday the fastest time was just under 4 hours and 3 minutes. When we wandered over to the finish line, 6 hours into the race, runners were still arriving. Since it is not yet tourist season in this area, runners can find inexpensive housing in a large vacation village/campground which has various kinds of permanent emplacements. It also has a restaurant and lovely grounds so that families can accompany the participants and make a kind of holiday weekent out of it. One major rule of the vacation village is violated in this pre-season occupation by runners: clothing is allowed. The village, during its regular summer season, is a large “naturist,” read “nudist,” vacation site. At that time, the naturist philosophy is strictly enforced, as can be seen in this poolside reminder. Everyone was fully clothed on Sunday. The runners certainly were since they had to deal with snow. For the rest of us, either naturism is not our option, or mid-March is still a bit cool, with the mistral blowing a bit too strongly, for a clothing-free afternoon.